If you are looking for a new late season fly pattern to chase after that lunker spawning steelhead and bewildered browns then this might just be the article you have been waiting for. If you are looking for a new late season fly pattern to chase after those lunker spawning steelhead and bewildered browns then this might just be the article you have been waiting for. Late spring is a time of year when the fish in our respective rivers have been seeing an increased number of anglers that are willing to throw every new fangled fly that they have ever heard of and come across at them. To set yourself apart from the other anglers that are fishing the same waters as yourself, fly section can make all the difference. Over the last few years my friends and I have discovered that what is needed is a fly that is both attractive yet skinny. By referring to a fly as "skinny", I am talking about a fly that is tied sparsely and compact. No long tails, extending flash, or overdone hackles. Fish at this stage of the season are very easily spooked by big, jerky obtrusive flies. Having a fly that you can present quietly and smoothly definitely puts the advantage back into your corner. Another major necessity of the flies that my friends and I use at this time of year is simplicity. Because the water level is finally starting to return to regular depths, the fish will be back laying very tightly to any cover they can find. So getting back into the swing of things and getting those flies in and out of the sticks means many hang-ups and lost flies. Having a fly pattern that incorporates cheap materials with minimal tying steps provides an angler with more time to spend out on their favorite waters instead of in front of their vise. 2.Select 4 strands of purple mylar and tie them down onto the hook shank behind the hook eye. With the tying thread wrap the mylar down back until you reach the spot above the hook point. Make sure when you are wrapping down the mylar that you keep all six strands together on top of the hook shank. At this point don't be afraid to wrap a little thread down on the hook shank to give the body a slight taper when you wrap the tinsel forward. 3.Take a pair of hackle pliers and grasp all six strands of the purple mylar at once. With the mylar pinched in between the hackle pliers spin the strands into a shiny rope by hand or by using your dubbing twister attached to your hackle pliers. Wrap this mylar rope forward until you reach the ¼ mark and tie off. 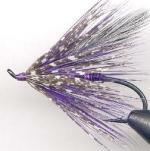 4.Select a purple saddle hackle to use as the front hackle for the fly. Try and find a hackle that has barbs long enough to reach at least the hook point. Tie the hackle down by its tip and stroke all the hackle barbs backwards to facilitate the wrapping process. 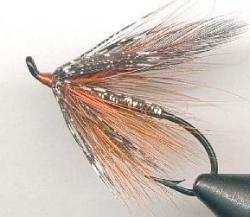 Wrap the hackle three to four times around the hook shank and tie off. 5.Select two perfectly matched black saddle hackle feathers and strip off the fuzzy hairs at the bottom of the feather stalk. Measure the hackles so that when tied down at the ¼ they reach the rear of the hook. Strip off any extra hackle barbs necessary to make the hackle tips sit on top of the hook shank. With a few light wraps of thread secure the hackle tips on top of the hook shank, and cut off the extra hackle stalks. 6.Select a black and white spotted guinea hackle and prepare it in the same way that you did the purple saddle hackle (tying it down by its tip and stroking the barbs towards the rear of the fly). With the guinea hackle. Take care when wrapping it around the hook shank seeing that none of the hackle barbs get tied down by proceeding wraps of the hackle. Try and only make only one to two complete turns of the guinea hackle around the hook shank and then tie off. If you find that after tying the hackle off you have a rather large knot from the stalk of the hackle protruding in your head of the fly; carefully trim it away with a razor and cover with thread. I find that the skinnier I make a fly (fewer wraps of hackle) the better the flies profile turns out to be in the water. 7.Finally, wrap the tying thread back onto the hackle a few times to create a swept hackle on your fly. Make sure that you do not wrap back too far and alter the position that the hackle wings sit at. One you have constructed a small neat head, whip finish and cement thoroughly. The Orange Simple Spey (shown above) is another of my favorite color combinations that I like to fish this pattern in for late spring steelhead.